Discussion in 'Other' started by TheLichten, Oct 20, 2017. With the permission of Mee (Bart Stroobants), the original creator, I bring you the updated and improved CarStat 2.3. You can find the original thread here. 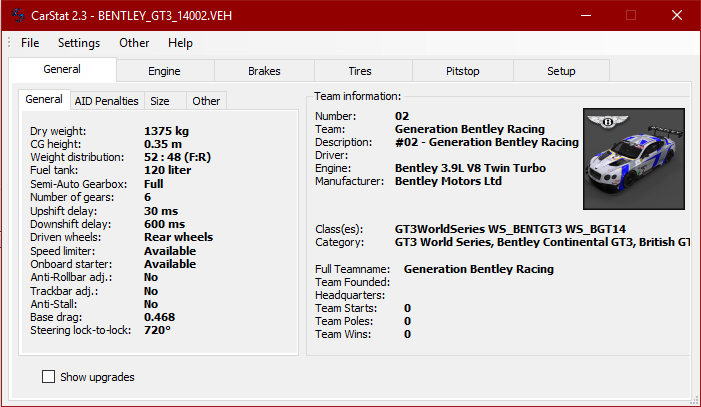 CarStat is a program that displays stats for cars that are inside video games, primarily rFactor 2, but also with support for rFactor 1 and GTR 2/GTL. To install it, you simply unzip the zip-file into any folder that you want, and you are done. To start it, you start the CarStat 2.3.exe. A window will open, giving you the option to chose between rFactor 1, GTR and rFactor 2. Starting the one of the first two will start the no longer supported CarStat 1.6, choosing rFactor 2 will start up the new and improved CarStat 2.3. Further instructions are in the manual, found on the wiki or in the help option in the toolbar. Note: You need to have the .NET Framework installed. If you do not have it, then you can find the latest version here. 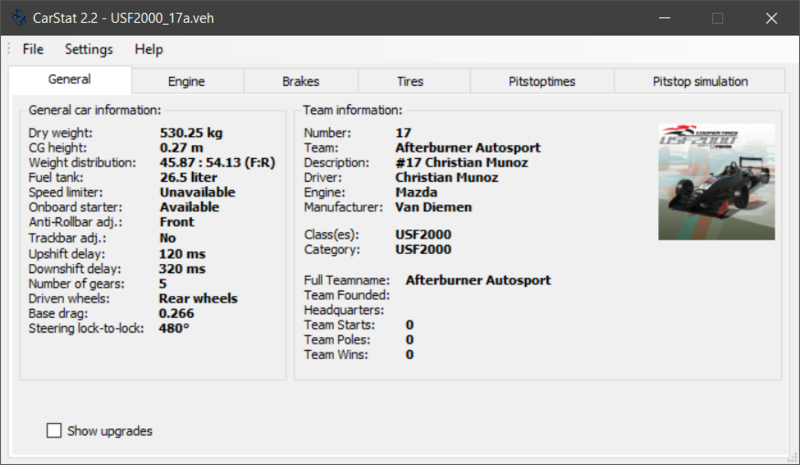 -Fixed that if no data was filled it will say "No Data" instead of "Loading..."
-Added Info for Weight Penalties with driver AIDs. -Made the Open Checked Car(s) button in the Vehicle Selector displaying Loading... while a car is loading. 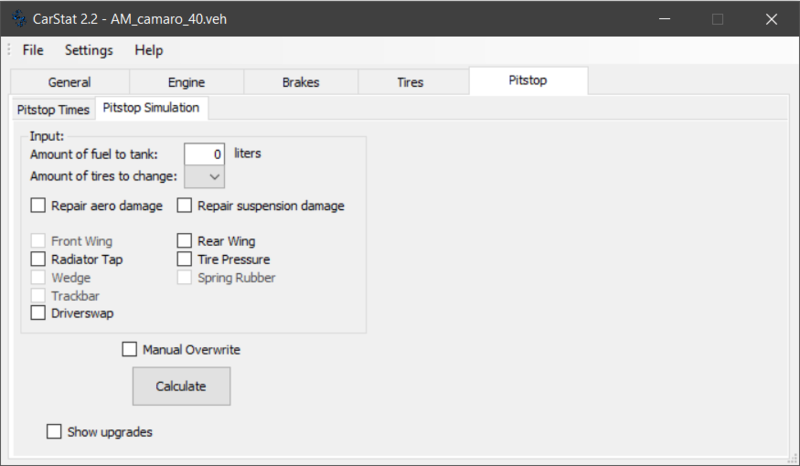 -Fixed Extra Engine Friction not refreshing the Labels correctly. -Added very basic turbo support (turbo v0.1). It assumes that max pressure is all the time. 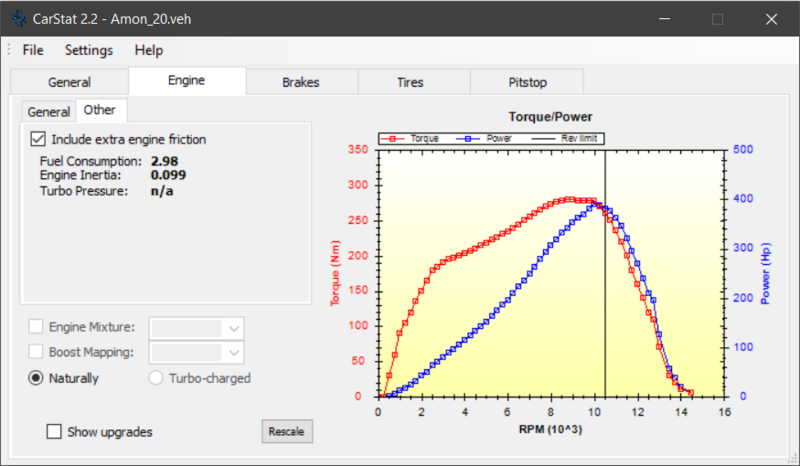 -Added Option to show the engine with Turbo-Charger (only turbo charged cars) and without (all). 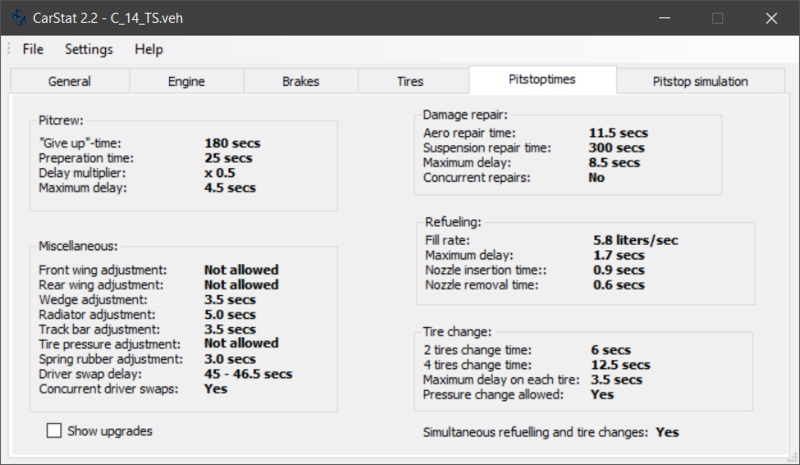 -Fixed Tire Pressure Adjustments on the fly being avaible while changing all tires. Most Issues should now be resolved, but if you find one or have any suggestions, you can submit them on this thread or on Gitlab. You can find there what I am work on. Alex72, Damian Baldi, momoracer and 34 others like this. thank you for this update of a great program, working great. Nice ! Im going to try it ! Juergen-BY, alpha-bravo, elcoco and 4 others like this. sorry for the noob question, but what file should we put please?! Could you be a bit more precise please? But I think you mean that CarStat 2 asks for quickbms. Well quickbms needs to be in the same folder as the CarStat 2 executable. It is in the zip-file, so extracting ALL content of the zip-file into a folder of your liking. If your issue is how to open a car, well I would suggest you to use the Vehicle Selector. Question regarding this. 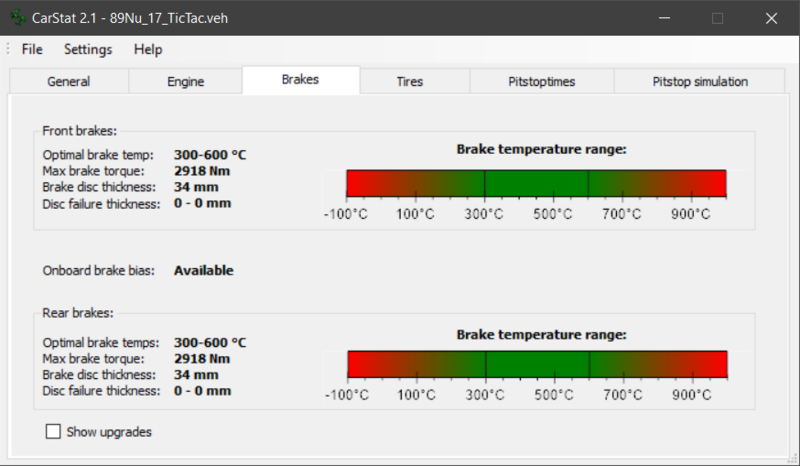 I gave opening the recently released BTCC NGTC mod in CarStat 2.1 and it showed some very peculiar values which I, or the other mod makers/testers, do not understand. Maybe you could shed some light onto it? As you can see, the grip bar for the Medium tire compound is higher than that of the soft tire compound. Also, the Medium's Wear Rate bar is higher than the Soft's is. Naturally, this should be the other way around. We've tried this and can tell from the feeling and times that the ratios for grip and wear is correct in practice between the Softs and Mediums while driving, but we don't get how CarStat can show this? Any idea @TheLichten ? You have loaded up one of the ngtcc, and you are looking at the Tires>General Info. 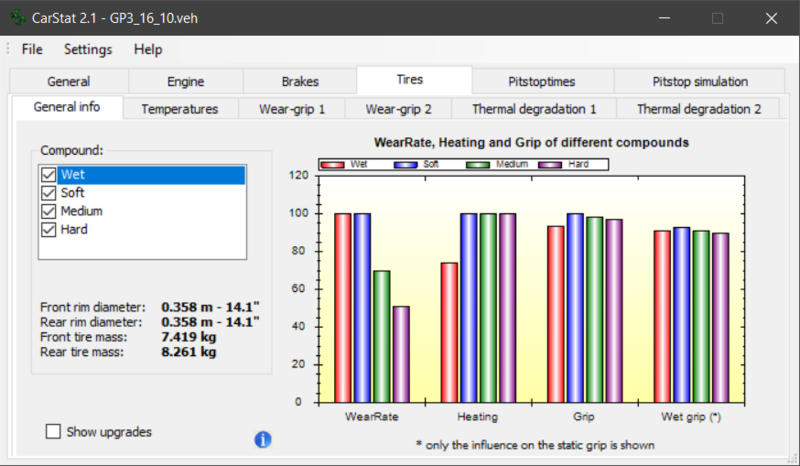 Now when you have all tires (Wets, Softs and Hards) checked (default), then the bars look right (softs have a higher wear rate, same heat rate, more grip and more wet grip then mediums (Remember the wets are listed first so they are the red bars). Suddenly the softs have a lower wear rate, less heating, less grip, but more wet grip then the mediums. Now this is a bug, were it removes the the mediums bar and relabels the bars to soft and medium, but does not load the values, so you are comparing wets to softs. I will fix this bug asap. It will ship with the next update, which should be out at the end of the week (Depending on if I can figure out how to use the turbo values in the engine file to calculate the power). I have been mostly working on internal stuff to make loading cars faster. Yes, it appears that this is what happens. I don't know why picture embedding isn't working for you as it works for me in Google Chrome but it looks like you got it. Excellent, thanks! 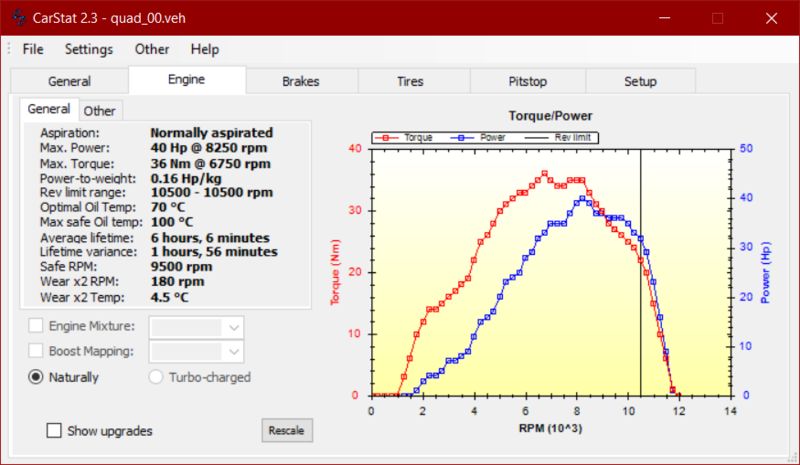 With the new Version 2.2.0 CarStat will not only show turbos on the Engine Tab, but also run a bit faster. Especial opening cars in multiview. 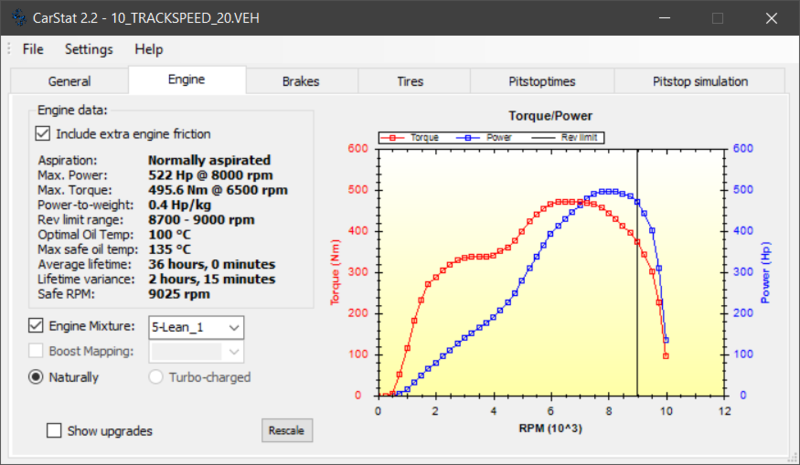 New Feature here are the maximum Rev limit (with this 799 you see it is 9000), the support for different fuel mixtures (and their power loss and gain), primitive turbo support (v0.1) and boost mapping. The General car info is now to the right, you can also see if you can adjust the Anti-Rollbars and Trackbar on the fly while driving and you can see the icon of the car. Alex72, Damian Baldi, Alexandr Meshkov and 18 others like this. Many thanks! 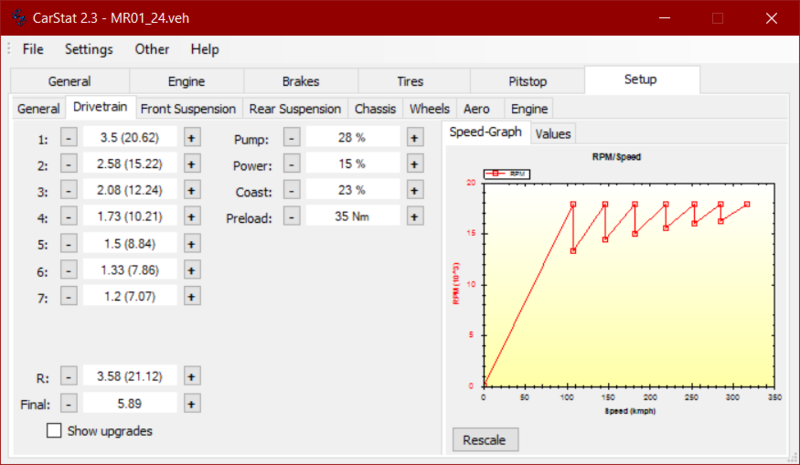 Just a short question, no matter wich car i`m using (Radicals, GT500...others) CarStat is crashing, when i select an Engine Mixture Level...is it just me? Here also happens, but the curious thing is that it only happens with the first and last value. The intermediate values work. Tested with the mod OW F1 2017. With the pack GT3 of Studio397 does not work because the files are encrypted with the new method. So, sorry for the long wait for a hotfix, but I just did not get around to publish it. Nothing major here, just a few crucial bug fixes. Juergen-BY and yippssy like this. //Edit: seems to be in the latest post only, download from first post is fine! And here is another "minor" update, fixing a few errors and adding some data. Now the biggest change is that the Pitstop Simualtion and Pitstoptimes tab are gone, with the Pitstop tab in their place. In this Tab you find the the Pitstop times and the Simulation as you know them, they just live now at another place. The Engine Tab now has an other data tab to show other data. For now you can find the the Extra Engine Friction, Fuel Consumtion, Engine Inertia and Turbo Pressure there. But also the General Tab now shows if the cars has Anti Stall and shows if the car has a Semi Auto Gearbox (and which type). Ho3n3r, yippssy, McFlex and 5 others like this.